Sinan Idrizi und Edi Rama. Dann bleibt die Frage, was jemand mit angeblich NUll Firma in Albanien, mit Edi Rama zutun hat. Eines der vielen Mafiosi Projekte des Edi Rama und Arben Ahmeti, wo geplanter Betrug immer dabei ist. Einer der übelsten Edi Rama Partner, der sogar FIFA Schiedsrichter bedroht, einen eigenen Fuss Club besitzt, aber keine Firma je gründete nur von seinen kriminellen Umtrieben lebt. Das nächste Betrugs Projekt der Vlore Mafia, wo dann erneut Tausende Tickets bezahlen, die Airline in die Insolvenz geht und Gestalten, welche noch nie ein Geschäft in Albanien registrieren liessen, sind Anteils Eigner der vorbestrafte Vlore Gangster, der einen eigenen Fussball Club hat, für Schmuggel und Reisen aller Art. Mitglied im Super kriminellen Enterprise des Albanischen Fussball Präsidenten Armando Duka, dessen Wahl von einem Tirana Gericht für ungültig erklärt wurde. Geldwäsche ohne Ende, das einzige Wirtschafts Gebiet noch in Albanien mit Hunderttausenden von illegalen Bauten und Beton Ruinen, welche von Hirnlosen Bin Laden erstellt wurden, wie vom Mubarak Clan auch in Montenegro. Un dwurde Ali Evsen, Mafia Airline Besitzer: Albanian Airline, mit einem der engsten Vertrauten von Mubarak in Spanien verhaftet: Hussein Salem. Ali Evsen: “Each man bears obligation to society regardless of his or her post and profession. For people of different profession this obligation differs. The businessman also has certain obligation. The businessman’s obligation to society is not limited with timely and correct payment of taxes. The payment of taxes is the obligation before government. The obligation to society is carried out by fulfilling civic obligations and to be of use for society.”The President of “EVSEN GROUP OF COMPANIES” Mr. Ali Evsen was born in Adana, Turkey in August 20, 1962. The secondary school he finished in a hometown, higher education he received in Azerbaijan. He graduated from faculty of law of Baku State University. During his education period he got closely attached to native Azerbaijan and its capital Baku. siehe den Verbrecher Clan Gjoka, einem wichtigen Financier des Salih Berisha. An Albanian national carrier, a proposed joint venture between Turkish Airlines and a new Albanian investment company, will begin flying this summer, one of its co-owners says. Design of an Air Albania plane posted by Prime Minister Edi Rama in its Facebook Page. Proposed flag carrier Air Albania, a joint venture being negotiated with Turkish Airlines, will begin flying European routes this summer with a view to making its first transatlantic flights by December, one of the men behind the venture has told BIRN. The Albanian government last month ordered national air controller AlbControl to negotiate a joint venture with Turkish Airlines and a newly-founded Albanian company called MDN Investment to create a new national airline. MDN Investment was registered on May 3 and has no known assets or previous experience in air travel. But owner Sinan Idrizi, who is known as a sponsor of sports teams in his native town of Vlora in southern Albania, told BIRN the company would be flying soon and that crew members were already undergoing training in Turkey. „We will be aggressive in the market,“ Idrizi, 50, told BIRN in a telephone interview. Idriz said he had business interests in Turkey but declined to say how much he expected to invest in the future joint venture. „This will be a matter decided later,“ he said. MDN Investment has a declared capital of 100,000 euros and Idrizi has no other businesses registered in Albania. 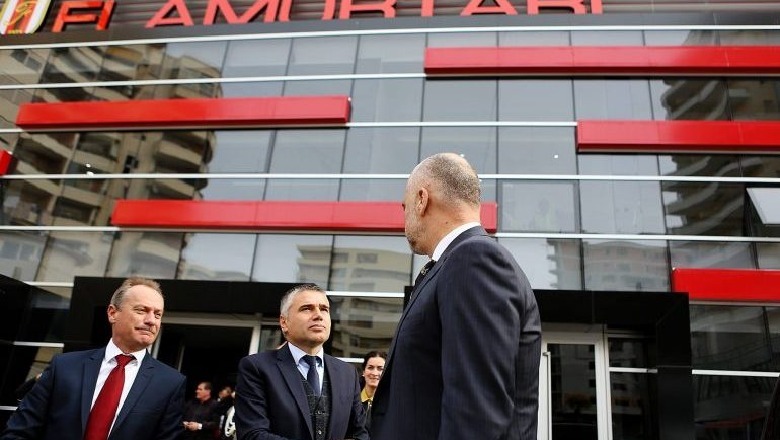 Albania Prime Minister Edi Rama last year asked Turkish President Recep Tayyip Erdogan for his help in creating an Albanian national carrier. Turkish Airlines has said several times that it is interested in the project. Rama has long promised to create the airline and to build an airport in Vlora.